With US dollar sentiment at historic lows, the dollar continues to be about as popular as a leper. In contrast, the yellow precious metal continues to be the belle of the ball. Today it closed at a new, all time high at the Comex. The December futures contract closed at $1045, decisively higher than even the intra-day high in March 2008 (when the fall of Bears Stearns lead to a panic). It wasn’t too difficult to anticipate a successful break above the hitherto challenging $1000 level. An analysis of the investor sentiment in gold revealed a mostly bland response to its advance this time around. Unlike previous rallies. As well, gold’s seasonality was the wind at the back of its uptrend. However, as you’ll notice from the seasonality chart in the previous link, a pull back is to be expected for gold in October. At least, that’s what has been average historical pattern. 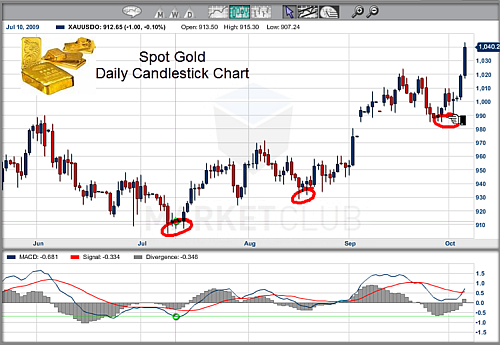 This recent move helps to cement the long term uptrend for gold, however it isn’t smart to chase it higher. Once a decisive break through tough resistance like this is made, it is typical to see a pull back to that level again as it acts as support. With the seasonality weakness about to kick in, that’s what I’d expect to happen. So keep watching this market for a good opportunity. Also keep in mind that there are many ways to play this. You don’t have to buy gold futures or the Gold ETF (GLD). There are many highly leveraged mining companies that provide a fantastic proxy for this precious metal. 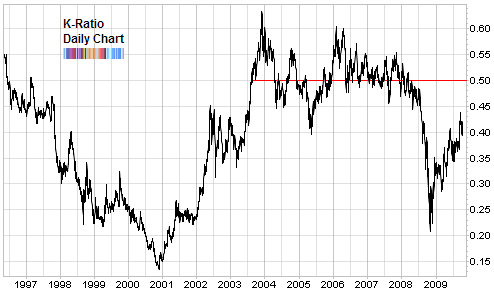 The K-ratio still has room to move higher, which means that relative to gold, gold equities are not expensive. Finally, the bigger picture is the slow decline of the dollar. I expect a rally in the US dollar, especially as the sentiment is so extremely pessimistic. But the long term trend is clear. There are some rumblings in the background that oil producing Middle Eastern countries, along with China and Russia are working together to stop pricing crude in US dollars. As well, the Reserve Bank of Australia wins a gold star for being the first among industrialized nations to start on a tightening cycle. Another way is to “cross my palm” with SILVER. But yes a dollar rally is probably underway, and I closed my short USD long EUR position.